Heidi S is done with her two summertops! Bettina is done - finally! The gallery is now updated, but please e-mail me if I forgot to include your 'work'!! I`m not 100 % happy with it but I did my best! Kitty`s ears look strange and her eyes is way too big! My two girls is fighting over it so it can`t be that bad, or what? have you see the wonderfull gallery ? CONGRARULATION!!!!!!!! WE ARE THE BEST GIRLS GROUP!!!! I had to rip out the shirt last night. I realized it was just going to be too big and there was no way to work with what I had completed. So sad. But all in the name of perfection, right? 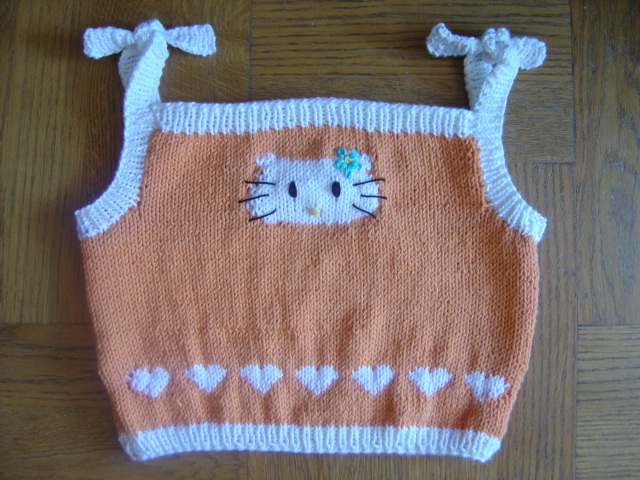 And my fellow Hello Kitty 2 KAL-ers, you expect nothing less than perfection, right? A gift too my granddaughter. I'm sorry everyone, I'm afraid that I have to drop out of the KAL with my tote bag half finished. I wish you all the best with the rest of the KAL, and again I'm sorry to everyone that I cannot finish. Hello all! I just started my summer top today and I stopped right before doing the hearts. It's bedtime for me! But it feels good to have something done. I am also sizing mine up for a seven year old, so as totally cute as the tie straps are, I might do thick strapes like Unni did. Any suggestions are welcome! Everyone's tops and bags look so nice! I finished today, and my daughter has already started to use it.She's staying overnight to a friend, and she had to use the purse. Finally it's finished, so now I am ready for the next project! I'm drowning in projects right now, I have two charity drives going and I have several gifts I need to make and I don't know when I'm going to be able to finish my tote. I don't want to break any KAL rules by not finishing on time in case I might be able to try to participate in a future one, please would someone tell me if I need to drop out or if I can just wait a little and see if I can get to it? My blue summer tote is finished, but there is no picture of it yet. I've started my tote in blue. I'm done with the front side, and hopefully I'll be done with the back tonight. Anyways, Laurence had a great idea about making a gallery of our 'work'...so I'll see if I can make something fun out of all the stuff we've been making during the week. 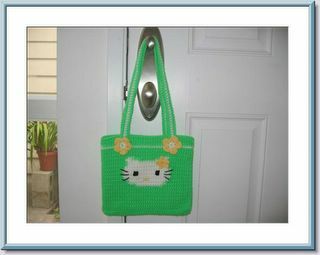 Here is the small tote I made for my baby sis. Thank you Oslofia for creating such a fun KAL! I have delayed my beginning with the top because I din not have enough pink yarn at home, and all of last week , I was hoping to get some time to go and byu some, but I didn´t, so today, I decied to make a striped one....I hope it will be okay=). The colours can bee seen in my blog. 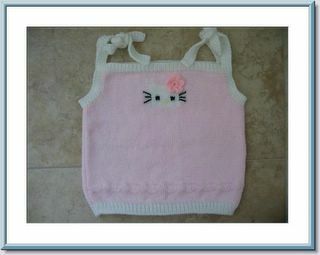 I have knittet size 6 months. Used a box of matches to show the size .. Ridiculously small! :D But I suppose it will fit my cousin ! 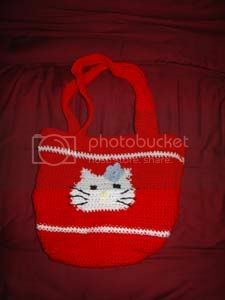 I just finished the tote. 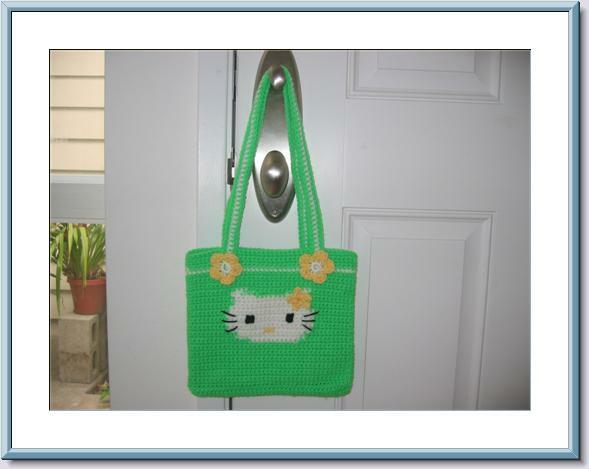 This was the first time I crocheted something else than flowers and scarves(btw. last crocheted scarf was finished in 2000). Check out my blog for a pic. Today I finished my summertop. 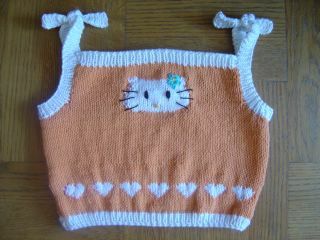 I`ve knitted a longer edition of the top because my daughter wanted it this way. I got some yarn left and it became a hat suited to the summertop. The owner is satisfied, and so is mum the knitter. Tonight I have started on the summertop. I suppose you all have knitted larger sizes than me because it looks quite different :) I am knitting size 6 months and it is going fast! Which off course I like, as the impatient person I am. I am using Mandarin Petit in pink and some unidentified yarn in grey. As I said; I knew it. I have not tried intarsia knitting often but I know I don't really like it. In this summer top there is both Fair Isle and Intarsia - and the Fair Isle border with the hearts went okay - but Kitty's head was awful, in my oppinion. I know I am a bit too "symmetrical" in my head, I prefer mu Opal socks to match as perfectly as possible and I hate it when pictures or shelves are hanging ever so slightly skewed...and I also know many knitters would have said my intarsia-Kitty was very fine - but I unraveled it and knit the front just like the back and now I am simply sewing the Hello Kitty face on the top instead. Part of my problem is the rather thin yarn - if I had been knitting intarsia in thicker yarn it would have been more even to look at but I disliked the uneven stitches. Here is the result of my bag. Take a look in my blog to see the picture. Hi everyone, I got my yarn and started with the ribbing today on the summer top. 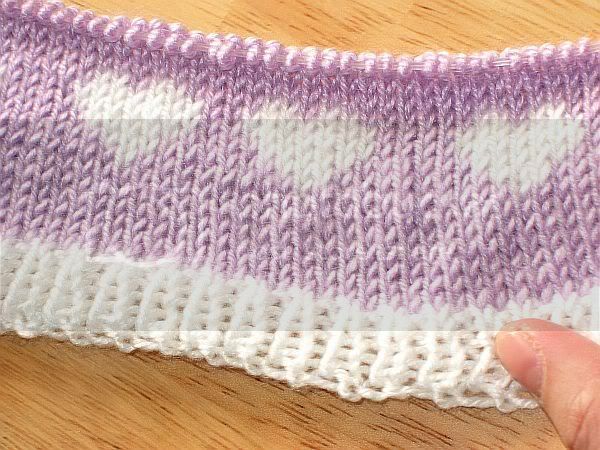 I'm using Caron baby sport weight in white and lavender! oooh soooo pretty! I'm already running into trouble, I've got the first row of heart done do I use the MC to purl across the back? or do I use the white to purl the heart? Hi.. I wonder if I can get some yarn brand names that you guys are using for the Summer Top. I went to the store to get 'Sport Weight Cotton' yarns and who'd have guessed it would be so hard..!!! I started my Summer Top yesterday (I have been placed in the wrong column, I am knitting the summer top and not crocheting the tote) because my DD Anna has her Grand Birthday on Sunday, she will be 3 and for the first time she is really looking forward to it. I bought some cotton in the local COOP-shop (Brugsen in Denmark), I chose the colours light lavender as main colour and hot pink for the hearts and borders *giggle* - the white yarn for Hello Kitty comes from the stash. I already can see myself knitting a summer dress for Anna in this cotton yarn and with these colours again - they may be special but they also are great (in my eyes). And here is how far I've come. Gimpelises tote is also done. So many efficient crocheters! Så er MIN HelloKitty-veske ferdig. Skikkelig sukkertøy-farger, men yngstefrøken syns den ble kul. Har sett mange puser med vakrere fjes en min Kitty ja, får håpe det blir bedre etterhvert. So, I thought that I could crochet...? hmmm... I learnt double and single crochet last week, and I didn't want to make these dishcloths as my first project. Instead, I thought I'd be challenged by a great Hello Kitty one, since I know little and big girls who just love the sweet cat. I looked at the pattern and whoa!!!!!!! Crochet 4 skeins.... turn.. turn.. and in my mind, goes.. WHAT? I'm going to be the one raising my hand up (or posting up here) and saying "teacher teacher can you help me please...!". Now I've started on the top. It's in yellow and turqouise, and I'm soon finished with the hearts. Pictures will come soon. I realised that the crochet flower will be to big for the motif on the top, so I embrodered a flower instead. I'll write a new revision of the pattern during the weekend, so you'll get that next week. Have a great weekend!!!! When I finished my shawl yesterday I started out with the summer-top. But that was really a hard transfer....from 8 mm needles to 2,5 mm needles! I think I will need to do something on 4 mm before I continue on this. I have started tonight, and I really think this summertop will be very nice. I have reached the pattern, so I in progress. I use Mandarin Classic, 2 threads of yarn and a 5 mm hook. I am just testing to post something here, to see if it works...=). Well, I think I will get started on the summer top tonight. I started my tote bag yesterday evening.I make it in mixed natural white and beige colours.Sirdar spree 149 yards/100g The front seems to be really nice .I use 1 thread and hook 4,5.